This species is accepted, and its native range is Temp. Northern Hemisphere, S. South America to Falkland Islands. Adventicia en Colombia; Alt. 2680 - 2680 m.; Andes. Arenaria rubra var. marina L.
Corion marinum var. leiospermum (Kindb.) N.E.Br. Lepigonum trachyspermum subsp. murale Kindb. Spergula marina (L.) Bartl. & H.L.Wendl. 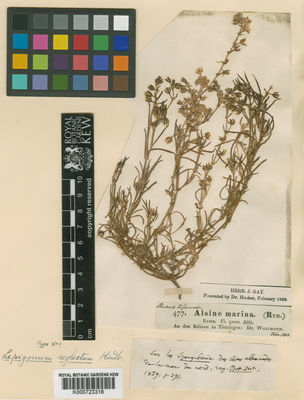 Spergula salina (J.Presl & C.Presl) D.Dietr. Tissa salina var. tenuis (Greene) Jeps. Barger, T.W. & al. (2012). New and noteworthy records for the flora of Alabama Castanea 77: 257-269. Krasnopevtseva, A., Krasnopevtseva, V. & Martusova, E. (2008). The news of vascular flora of the Baikalsky reserve Turczaninowia 11(4): 47-49.